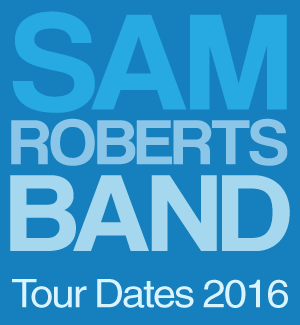 sam roberts band is a spacey rock sextet from montreal who write groovy, jamming singalongs. in light of changing goals, sam and the band turned their focus to hook writing and open-ended lyricism. low on sleep and ready for a change, they incorporated elements of psychedelic, electronica and heavy rock into their new sound . . . with the help of youth (aka martin glover), producer and confidant, sam and the guys slaved over writing a bright yet seductive dance record. audiotree records intimate studio sessions with bands in their chicago studio. it’s the same studio where srb recorded collider. the five-song set list includes the last crusade, golden hour, shape shifters, we’re all in this together, and never enough. if you wanted to keep this performance in your hot little hands (because why wouldn’t you? ), you can download it for six bucks and it’s all yours, forever and ever. or at least until your laptop dies. so two years for me, tops. according to my not-so-scientific calculations, audiotree’s first-ever use of the word “sextet” officially (unofficially) includes saxologist chet doxas as a card-carrying band member. 1. josh is wearing a terry fox sweatshirt. just in case you’re not canadian. 2. eric likes sci-fi. also, the band supergrass. 3. sam also likes sci-fi. so does his dad. 4. james, sam, and eric all went to high school together – loyola, in montreal. 5. dave does not say one word the entire time. also . . . chemical city is kinda a concept album, says sam. despite a thousand million listens (and – brutally – the name of this blog), i did not realize this, and even now i’m still not quite sure i understand. i’m gonna go do some research on chemical city, concept albums, and how to write a thesis. in the meantime, you just sit back, relax, and watch this audiotree session. This entry was posted in news on May 15, 2014 by annie.